SITLESS was represented by 8 people from the consortium to the 7th Conference of HEPA Europe in Belfast. 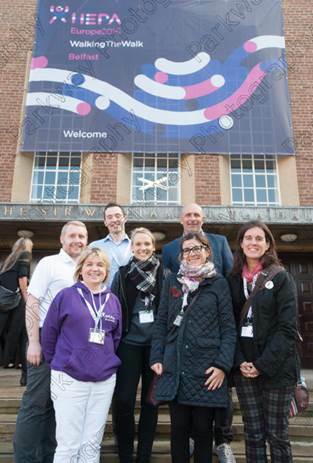 Queen’s University of Belfast was the organiser and host of the conference. Summary and abstracts of the symposium is presented below. To promote active and healthy ageing, reducing sedentary behaviour (SB) among older adults remains a challenge alongside increasing their levels of physical activity (PA). However, complex behaviour change is required to achieve and maintain benefits gained from specific interventions. 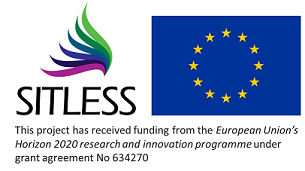 SITLESS aims to provide new evidence on how to develop a robust complex intervention combining the effects of a PA intervention with self-management strategies to decrease SB in community-dwelling older adults, and test it using objective and validated measures. To provide an overview of the SITLESS project, a multicentre clinical trial aimed at reducing SB and increasing PA by enhancing existing exercise referral schemes with self-management strategies. To present the results of two systematic reviews conducted as a previous step to define the intervention, the feasibility study and the definitive trial. To discuss methodological challenges of reducing and measuring SB, as well as how to assess the cost effectiveness of this international intervention. The overall aim of SITLESS is to assess the long-term effects of a complex intervention based on existing exercise referral schemes enhanced by self-management-strategies on SB and PA levels in community-dwelling older adults. Self-management strategies are based on goal setting, self-monitoring, problem-solving, social support and linking with neighborhoods resources, and will enhance a PA intervention that comprises strength training, balance and endurance. The intervention was robustly designed based on the results of two systematic reviews, involving end-users and stakeholders through focus groups and advisory boards. A feasibility study has been conducted with a process evaluation. Lessons learned from the feasibility study and their impact on the definitive trial will be presented. This review investigated components of interventions focused on reducing SB in older adults and assessed their effectiveness. Six databases were searched. Five relevant studies were identified from 11,568 records. The mode, frequency, intensity and time of delivery were mixed across interventions. Modes of delivery included information booklets (n=3/5); face-to-face consultations (n=3/5); tailored mail-outs (n=2/5); telephone calls (n=1/5); and group exercise training (n=1/5). Behaviour change techniques used across all interventions included goal setting and instruction on how to perform the behaviour. Statistically significant improvements pre- versus post-intervention in one or more SB dimensions were measured in 5/5 studies. The current evidence, although limited, indicates that interventions have the potential to reduce SB in older adults. Wirth KJ, Klenk J, Brefka S, Faehling K, Roqué M, Tully MA, Rothenbacher D, Denkinger MD, Stubbs B. We conducted a systematic review to investigate the association between objectively measured SB and various biomarkers in older adults. Two independent authors searched major databases with specific search terms and exclusion criteria. 12,701 abstracts were screened, 275 full text articles retrieved and 26 articles finally included. Most biomarkers were of cardiovascular or metabolic origin. Main markers were: body mass index (n=15), waist circumference (n=15), blood pressure (n=11), triglycerides (n=12) and high density lipoprotein (n=15). Some inflammatory markers were identified such as IL-6, CRP or TNF-a. The few biomarkers studied with SB were related to the cardio-metabolic system including markers of systemic inflammation. Caserotti P, Oviedo, G, Giné-Garriga M, Tully MA, Denkinger M, Klenk J, Salvà A, Skjødt M.
Accelerometers provide an objective assessment able to capture the whole spectrum of activity/lack of activity and they are therefore suitable for identifying both total volume and daily patterns of SB and PA. Nevertheless, methodological bias resulting in over/under estimation of sedentary time may occur with accelerometers. The different existing healthcare pathways in the four SITLESS sites is a challenge which may translate into the enrollment of older citizens with various functional profiles and sedentary habits and the risk of misestimating SB with accelerometers. This session will focus on key challenges and opportunities to assess SB using accelerometry methodology in older adults. Issues like choice of device, anatomic placement, SB definition, pattern evaluation and different level of SB in relation to the specific target groups will be critically addressed. The focus of this session is to discuss the key methodological issues related to the multi-country economic evaluation of the SITLESS intervention. Key issues include: (a) cross-country heterogeneity in demographic structure, (b) outcome measurement in the older population, (c) differences in health care systems, (d) unit cost sources and (e) country-specific availability of healthcare services. Full consideration of these issues requires an appropriate methodology for the identification, measurement and valuation of costs and outcomes. Multinational costing needs to account for specific issues, such as currency conversion, purchasing power parity adjustment and methods to value costs. The cost-effectiveness of this complex intervention is also likely to be influenced by cultural differences in relation to valuing exercise and PA.